HOW A COLLECTOR FROM AUSTRALIA FOUND THE FASHION ICON NOBODY KNEW EXISTED. I grew up with a love of vintage glamour and girl detective stories. And last summer, the two came together in the most unexpected way. I’ve been collecting 1950s cocktail dresses for over 10 years, and my favourite label of all time is Lilli Diamond. Over the years, I had made a number of attempts to find out more about the real Lilli Diamond. I'd done countless web searches, looked in books, old magazines and asked vintage clothing dealers. Nobody knew anything. It was weird. For a label so popular, it just didn’t make sense there was no information out there. Most people I spoke to concluded she wasn’t a real person after all, that Lilli Diamond was a fake name dreamed up by a corporation. With no information to the contrary, I started to think they might be right. 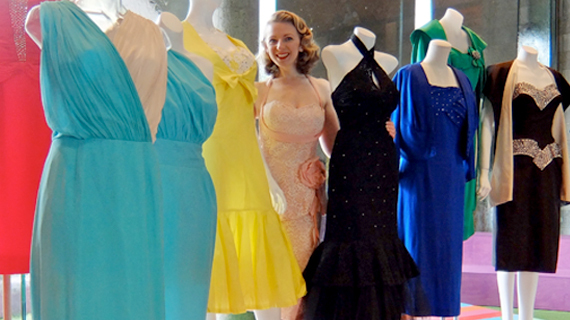 Then last year, a friend and I were invited to exhibit some vintage clothing at the National Gallery of Victoria. Naturally we chose our Lilli Diamonds, and set up an exhibition and Q&A with the public. The beauty of the dresses really captured people’s imaginations, and they started asking questions we just couldn’t answer. Who was Lilli Diamond? What inspired her? Why just cocktail dresses? Did movie stars wear Lilli Diamonds? I became determined to find out once and for all. I went back to my friend Google and dug deeper than ever before, until I found the one sentence that unlocked it all. In the database of the US Office of Patents and Trademarks, there was a record of Lilli Diamond Originals trademark from 1951. It stated, "Lilli Diamond is the name of a living individual whose consent is of record.” Boom. There was the proof. But 1951 was a long time ago. Was she still alive? Was she still in California? How could I find out when I’m in Australia? Lilli and I talked for about half an hour, and I found out more about the label than anyone had heard in the past 50 years. I don’t think I slept at all that night. My head was racing in a thousand different directions, but there was one thing I knew for sure. I had to meet her. Two weeks later, I was in California meeting Lilli for the first time. I interviewed her about her life, her career and of course the label. I turned the whole story into a feature article for Frankie magazine, and one day I'd love to write a book about Lilli, the label and my collection. There’s definitely enough stories, and beautiful dresses to go around. Lilli and I wearing Lilli Diamond. This image originally appeared in Frankie magazine.